Then let this tutorial will take you a step further with the same set of dies. All you need to do is play and get your imagination working and see what you can come up with. 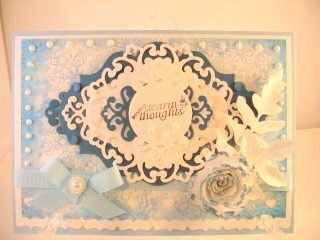 So from that set of dies you now have yet another idea to increase your cardmaking skills. When you first get your die sets start by cutting them all out in some plain white scrap card and then you will be able to layer them up, seeing which goes with which other, and play around without wasting your good stuff. I promise you, you will probably run out of time before you run out of ideas. 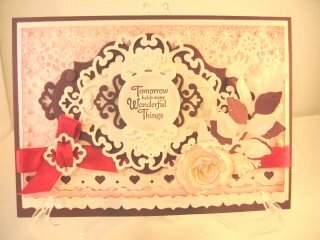 Spellbinders are bringing out new dies all the time and they are becoming more intricate and lacy with each one. Some of them produce the most beautiful shapes and would look wonderful gracing any of the cards you make. Choose carefully as you add them to your collection and they will all work with each other throughout the collections.